Neat Iota Xplorer review | What Hi-Fi? It’s fair to say most hi-fi speakers are demanding houseguests. Most we test intrude quite heavily into the living space, refusing to sound balanced when placed near rear or side walls, let alone close to a corner. It’s as though engineers in the speaker industry, as a whole, are so focused on getting the best sound under optimum conditions they seem to forget most people can’t devote a room solely to hi-fi. That’s why Neat’s original Iotas (£735) proved such a breath of fresh air when they were launched in 2011. These are tiny speakers that can fit anywhere, from a windowsill to a shelf, and still sound good. Sure, if you pamper them with proper stands and precision placement they perform even better, but the point here is you don’t automatically need to. Their unfussy nature was successfully transferred over the floorstanding versions, the Award-winning Alphas (£1385). 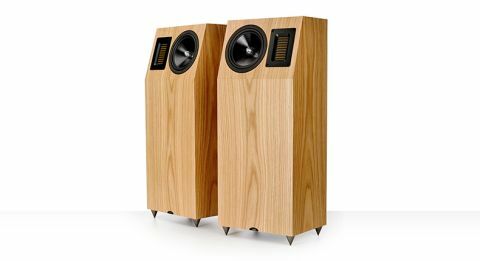 These odd-looking boxes are barely tall enough to graze a knee, yet still manage to sound better than most conventional alternatives. The latest members of the family, the Xplorers, are even more ambitious. Priced in premium territory, they have to couple the Iota’s friendly nature with the quality of performance of more overtly purist designs. Anyone spending £3500 on a pair of speakers isn’t going to want to compromise on sonic performance, even if derives from a less demanding attitude. At first glance, the Xplorers just seem to be scaled-up version of the Alphas, but take a closer look and you’ll find the engineering is more ambitious. It’s the isobaric bass arrangement that grabs our attention. Look at the base of the cabinet and you’ll notice one of Neat’s trademark 17-cm drivers. What you won’t see is a second, identical, bass driver mounted directly behind it inside the enclosure. Used in an isobaric arrangement these drivers move in tandem, fooling the outer unit into acting like it’s mounted in a considerably bigger cabinet than it really is. If done properly, such a design can give taut, extend bass at a given cabinet size. That we don’t see such designs more often is probably due to the cost of the extra drive unit and the difficulty in optimising the results. The Xplorers are a 2.5-way design. While the deepest notes are taken care of by the twin downward-firing bass drivers, the combination of Air Motion Transformer (AMT) and 17cm mid/bass units on the angled baffle deliver further up the frequency range. This top section is internally partitioned, and the two drive units work in a two-way infinite baffle arrangement. Build quality is good, though not outstanding at the price. Neat is a far smaller company than the likes of B&W or KEF, and it shows. Neat’s products don’t tend to have the design slickness of such rivals, even if they’re perfectly nicely made - which they are. There are four finish options – American walnut, Natural oak, Black oak or Satin white. We find the Xplorers undemanding in use. At 87dB/W/m the sensitivity isn’t particularly high. We recommend an amplifier with a decent amount of grunt if you want to play music at high levels. But the impedance curve is friendly, with a nominal value of 6 ohms and a minimum of just one below that. In short, these speakers are an easy load for any amplifier to drive. We try a variety of amplifiers from Rega’s Elex-R to our reference Gamut D3i/D200i pre/power with good results. The accommodating nature of the Xplorers means though they will readily show the differences between electronics, they don’t necessarily grumble with less capable choices. Still, there’s little point in spending this much on a pair of speakers if you’ve skimped on the rest of the set-up. With that in mind we use our usual source components, consisting of Naim’s NDS/555PS music streamer and Clearaudio’s Innovation Wood record player (feeding Cyrus’s Phono Signature/PSX-R2 phono stage). It doesn’t take long to get the Neats singing. The company suggests starting with the speakers around 20cm from the rear wall and at least 50cm from the sides - and that’s pretty much where we end up. They’re single-wired, so there’s no fussing with two sets of cables. We use the speakers with the AMT tweeters on the outside edge. There’s no harm in using them on the inside, if that suits your room and tastes better, though. It’s worth playing around with toe-in towards the listening position to fine-tune the solidity and spread of the stereo soundstage. In no time we’re concentrating on the music rather than the set-up of our system. That’s the point here. These Neats – like many of the company’s products – are about the music rather than the hi-fi. It means if you’re after the last word in transparency or resolution, or even if you want the ultimate in tonal purity, we would point you in another direction. The Xplorers, while perfectly capable in all these respects, are much more about the musical experience rather than the analysis of the recording. Play Stravinsky’s The Rite of Spring and we’re carried away by the passion and drive of the piece. The Neats capture the excitement wonderfully and deliver the music’s savage dynamic shifts with puppy-like enthusiasm. You don’t get masses of bass – these remain relatively compact boxes, after all – but they deliver enough in the way of low-end authority and floor-shaking punch to keep us satisfied. At first we wonder whether such short speakers can deliver a good sense of scale, but it takes just a matter of seconds to cast such doubts aside. Their angled drivers produce enough in the way of height to make the Xplorers comparable to more conventional alternatives. The stereo image itself is decently precise and layered, though lacks the expansive nature of rivals from the likes of PMC and Spendor. But such rivals can’t match the Neat’s musical cohesion or the way they communicate complex rhythmic patterns. We listen to a range of music, from Alt J’s This is All Yours and Kanye West’s Yeezus all the way through to a Nina Simone compilation - the Neats sound right at home each and every time. They have plenty of enthusiasm, balanced with enough finesse to keep us happy. Alt-J’s set shows off the Xplorers’ ability to organise a dense recording while keeping the core emotions of the music centre stage, while Yeezus gives the speakers a chance to put the spotlight on attack and punch. With Nina Simone, we’re transported back in time. Simone’s voice has presence and body, and is delivered with all the passion it deserves. There may be four drive units at work here, but Neat’s engineers have succeeded in making these speakers sound as seamless as they come. It’s clear we like these speakers a lot. Though not perfect – we haven’t heard anything that is, regardless of price – these odd-looking boxes have a way of delivering the music that is truly spellbinding. If it’s all about the music for you, as opposed to absolute sonic transparency, give these Neats a serious listen. You won’t be disappointed.